What if Netflix auto-paused when you fell asleep during Citizen Kane? Netflix's internal hack-day has thrown up a doozy of a feature - or should that be dozy? No? Okay. Using your Fitbit, devs devised a way to fade audio out and automatically pause a film when you doze off in front of it. Good for the Fitbit wearer, less ideal for the others watching along with them. When you wake up, Netflix then shows you how much you missed while catching some Z's before the auto-pause kicked in, giving you the option to restart from either the point you fell asleep or the point that it paused at. Other Hack Day inventions include Netflix Beam which uses the Bluetooth-based iBeacon tech to let you share Netflix videos and accounts between iOS devices by bumping them together. Another thing we're in favour of seeing hit Netflix proper is a radial typing mechanism for use with gamepads and the ability to build custom playlists for the cinema programmer inside us all. 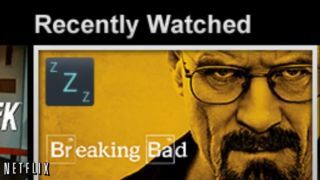 You can check out the most popular hacks on Netflix's Tech Blog. Sadly there's no guarantee that we'll see any of these features come to the streaming software, but it's amazing to see the cool features that people can throw together in just 24 hours.